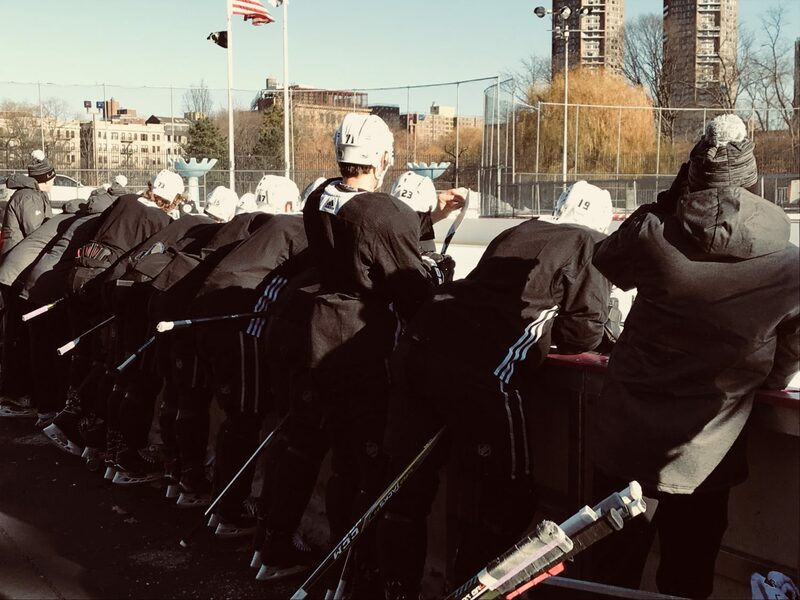 Any circumstances leading into Wednesday afternoon’s practice were an afterthought. 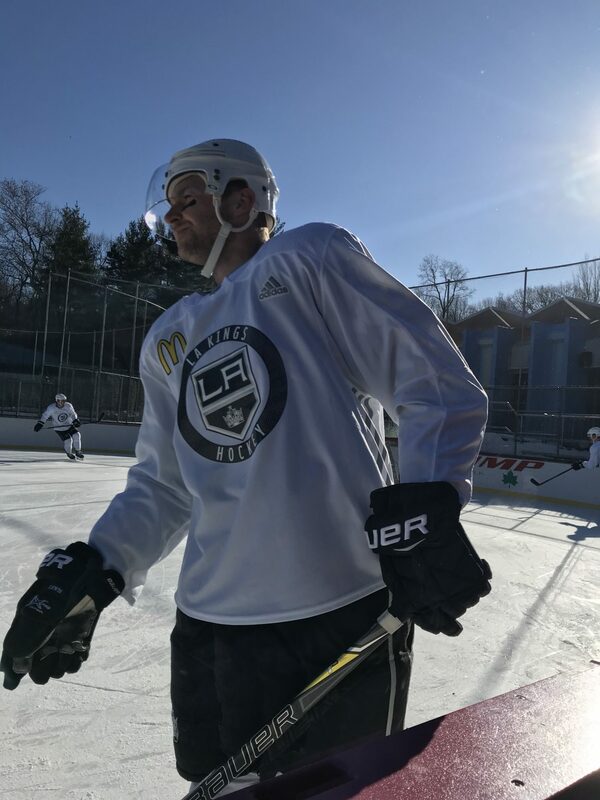 Never mind the 32 games under the team’s belt, or the fact that Jeff Carter hasn’t played since October, or the team’s 5-1 defeat to the New Jersey Devils the night prior. 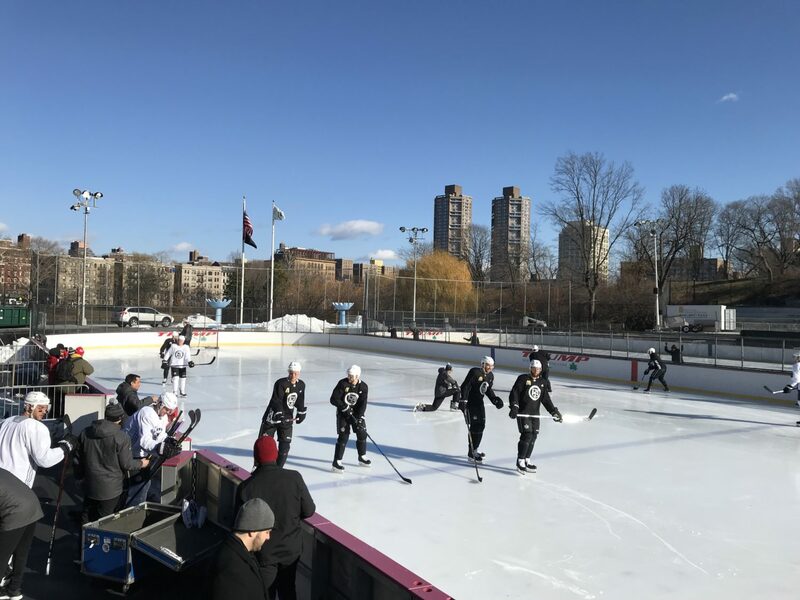 When the Kings took the ice at Lasker Rink on the north end of Central Park, it was the NHL equivalent of kids playing shinny up and down a frozen pond. 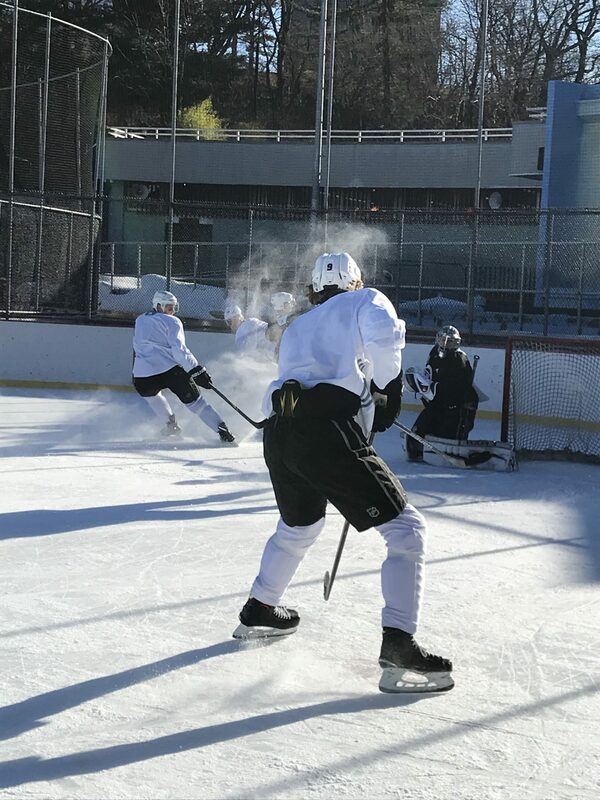 First, there were the requisite flow drills to get touches in, warm up the goalies and work up a needed sweat on a day in which it almost crept up to 30 degrees. 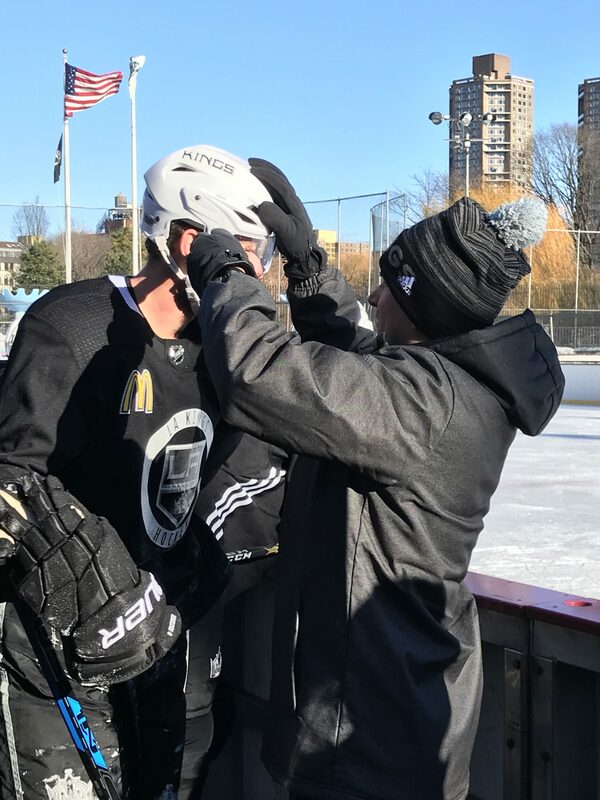 And then, because hockey players work best when there’s competition and a score and an opportunity to rub your teammates’ noses in it a little bit, several two-on-two rushes quickly morphed into a first-to-three game of three-on-three on a not-quite-regulation-size rink. 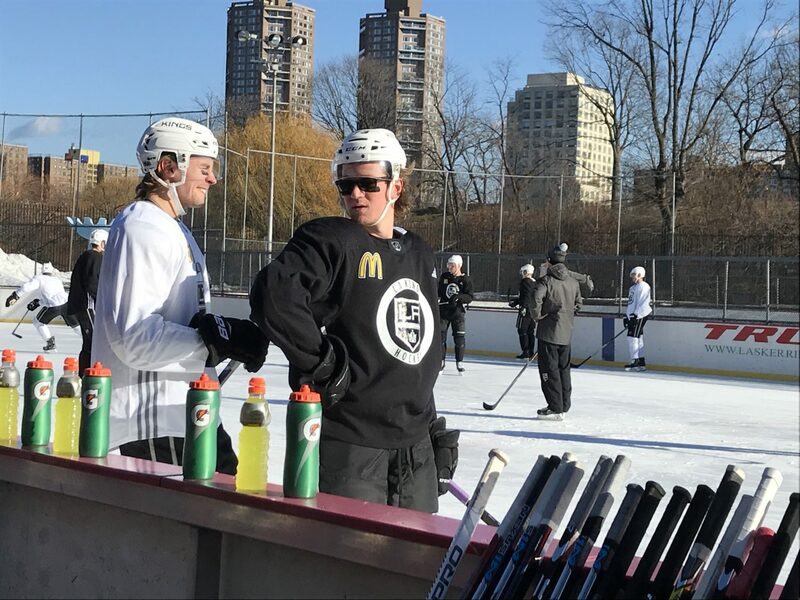 It was cold but sunny – Tyler Toffoli wore sunglasses on the ice for the first half of practice – and the sun shone directly on the side of the ice Darcy Kuemper tended. 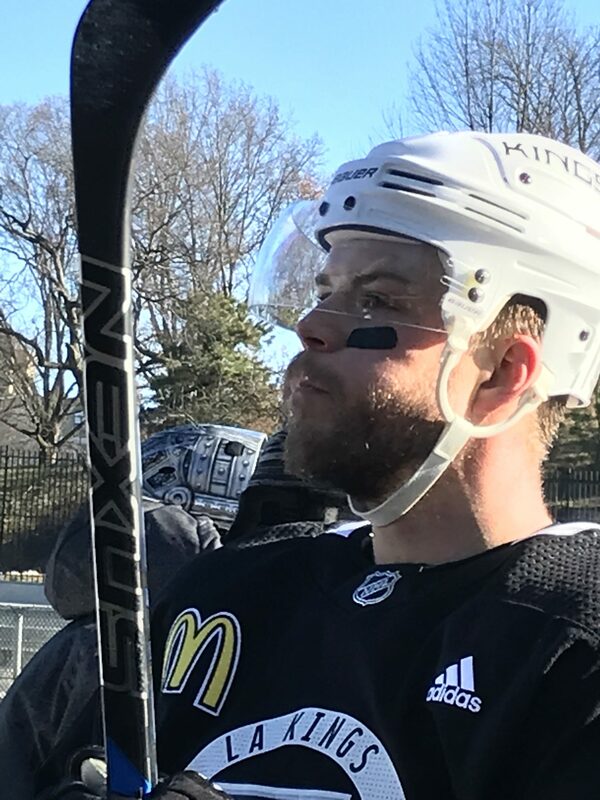 The sun necessitated eye black, but otherwise didn’t drastically affect the players’ approach. “Just hope the guys don’t hit you in the head. 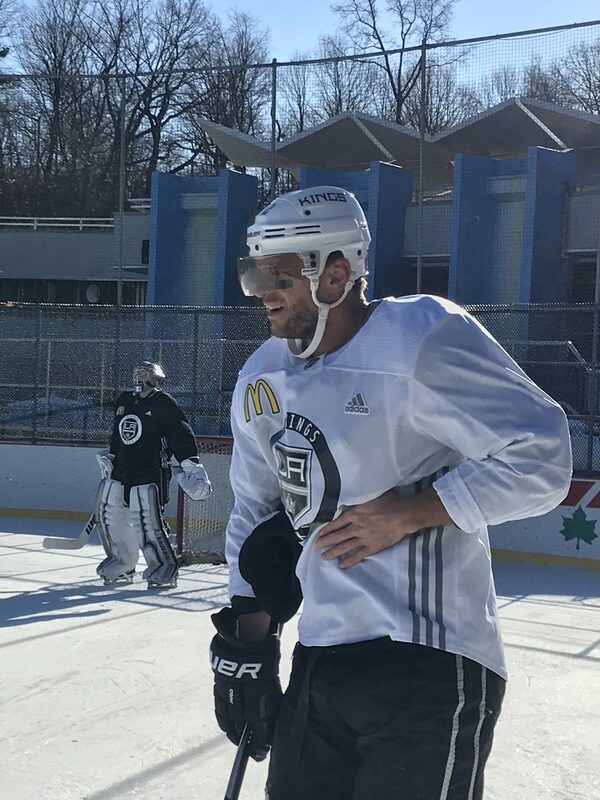 Just try to play positional,” Kuemper said. 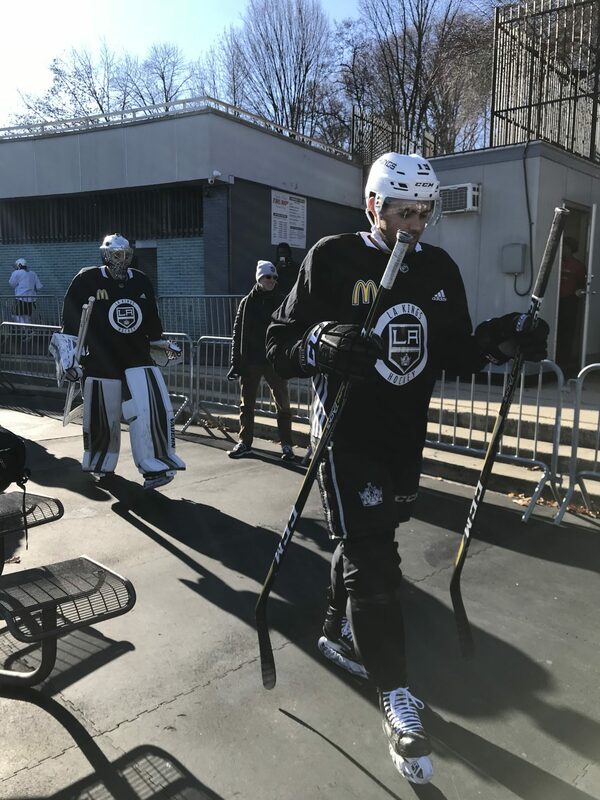 But, these are hockey players, and hockey players enjoy good-natured chirps and contests and reminding their teammates when they’ve made them look good, or foolish, even in practices back in a much warmer El Segundo. 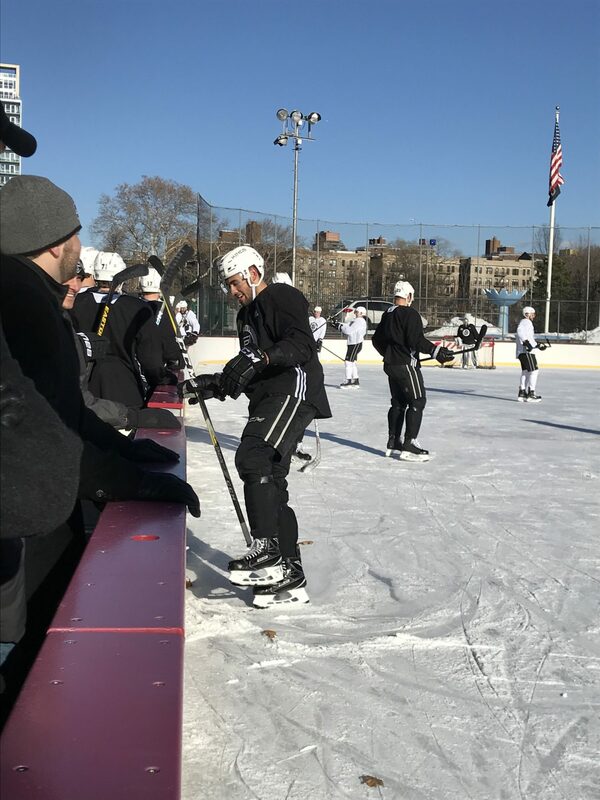 Ultimately, one team did score three goals, even though there was a lull in the scoring and the discussion of whether Lasker Rink was equipped with lights. 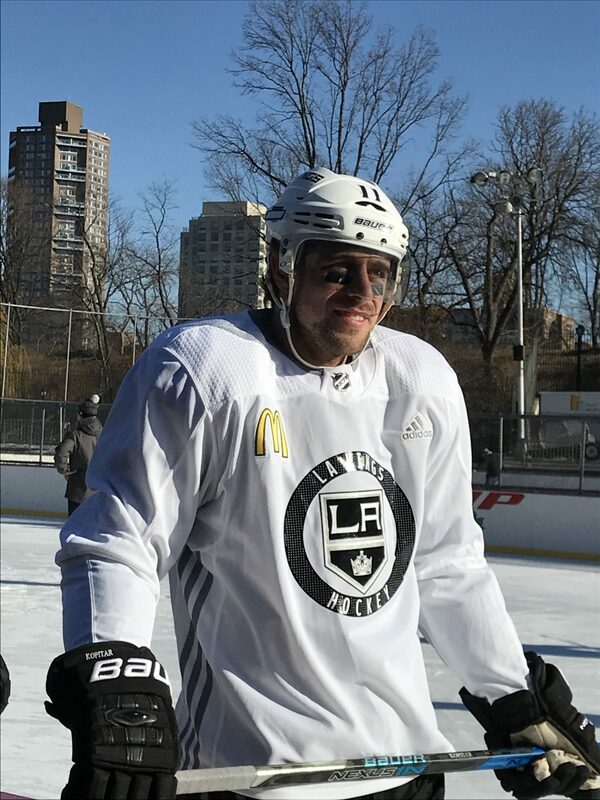 Marian Gaborik netted the game-winner one day before he’s expected to play in his 1,000th NHL game. But the principals and the details weren’t of particular importance. Nor were the rules, apparently. In the summertime we looked at the schedule and we kept going back to it. We had Rob [Koch] look ito it and see if we could get an opportunity. Obviously, the weather, we had some contingency plans along the way, and just kept watching the weather hoping it was going to work out, and it did. Just a little bit of a different look for the guys. Back to your roots, outside. I was hoping it would be a little bit colder, it’s fine. 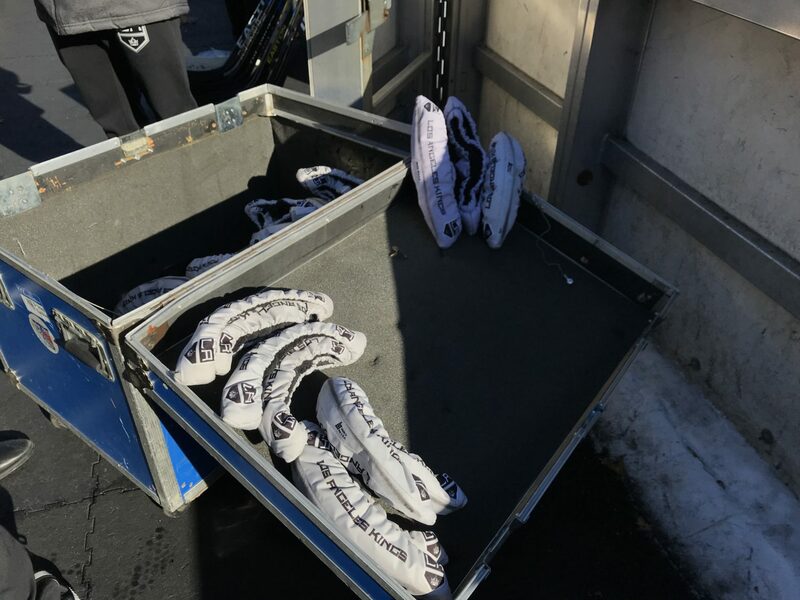 We kind of figured we just wanted to get some touches in early. 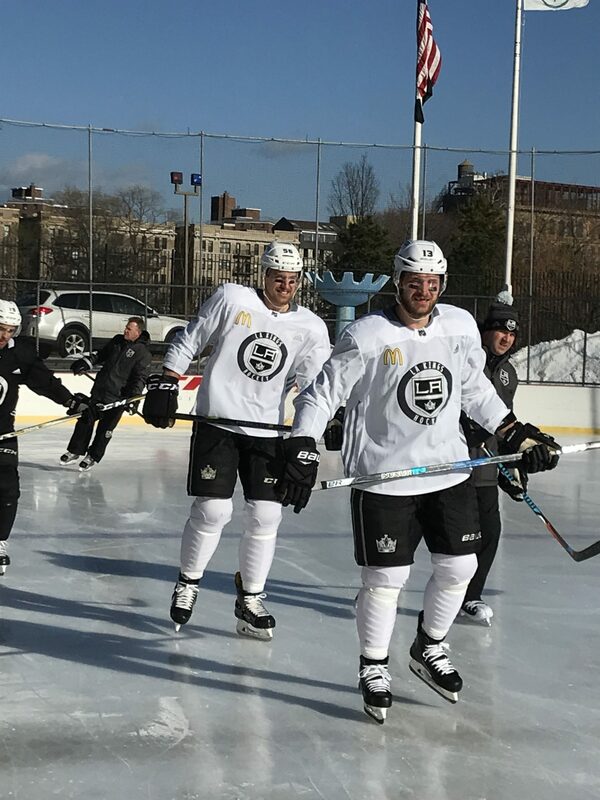 It’s a different-sized rink. 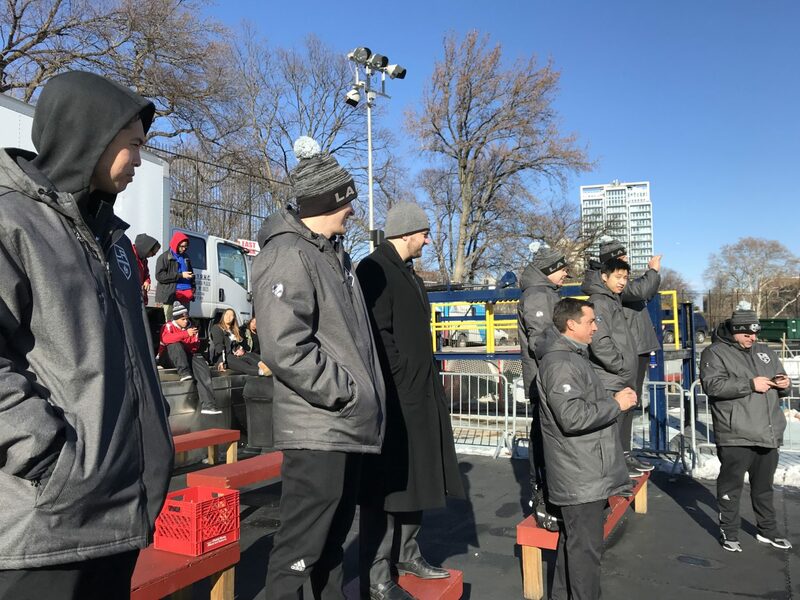 We knew as soon as we got to the compete part of it, that’s when the guys ramp it up a little bit and it becomes fun and competitive and they can’t help it. I know how it feels to be a referee, too, because I was a refere. Guys were yetlling at me the whole time, but it was good. It took a little longer to score than I thought, but it worked out all right. 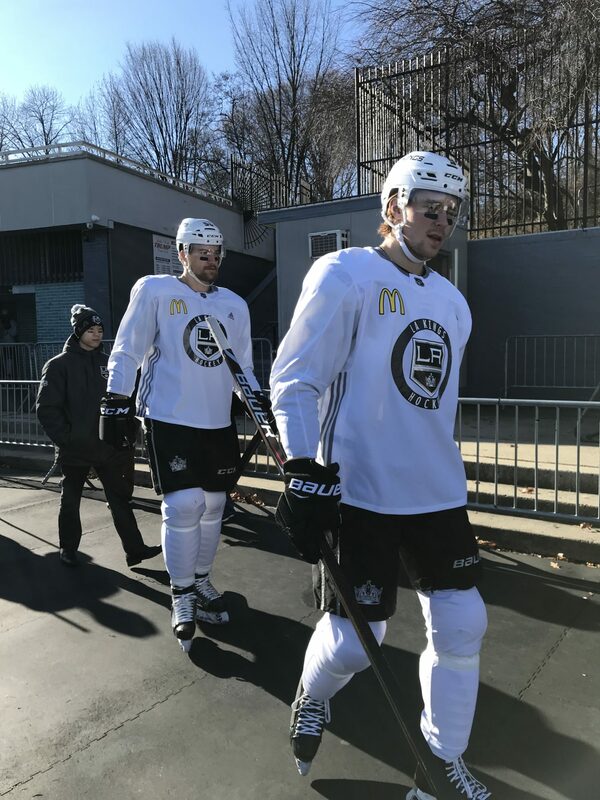 [Reporter: Toffoli was saying that not everything was getting called out there on that three-on-three.] No comment. [Reporter: No challenges? Neither team used their challenge?] No, that stayed clean, so referees must’ve done a good job. Lots. Lots. 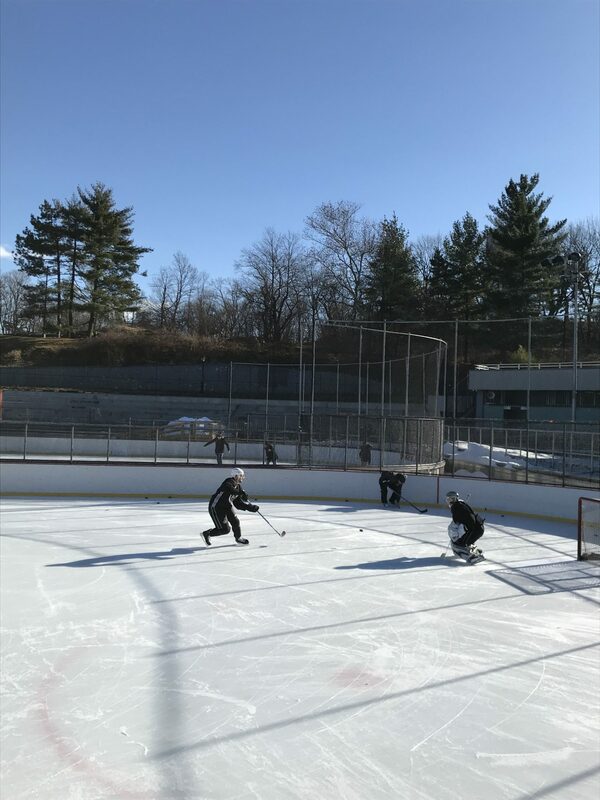 Grew up in the country, and you either skate on the lake, or there were a couple irrigation ponds down the road that we could skate on. Yeah, lots. We hope so. I think you’ve got to be energized physically and mentally, and hopefully it does both. It’s a big trip for us, obviously. We’ve got two days to get regrouped here for a big weekend. Get the guys outside a little bit today, get some work done. 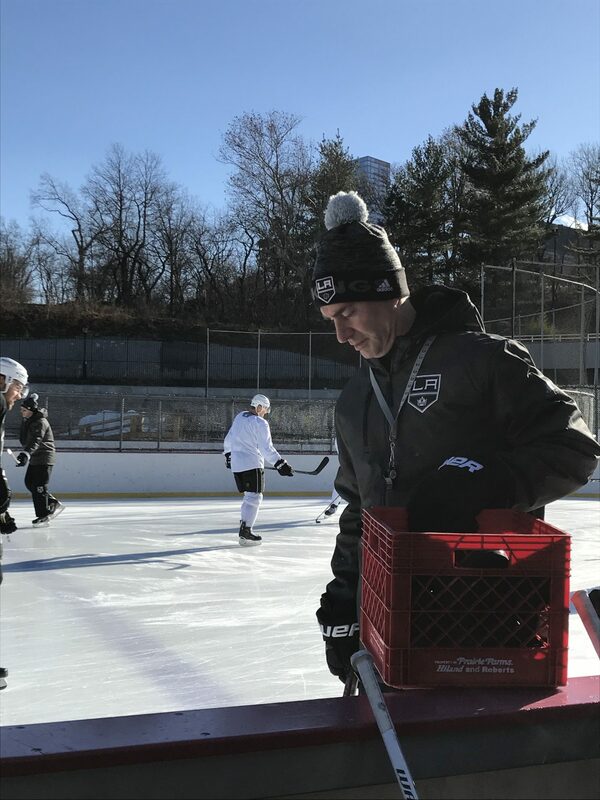 A different experience here, but still get on the ice, get some touches. That’s the intent, anyway. Well, I think he’s at a crossroads in his career. 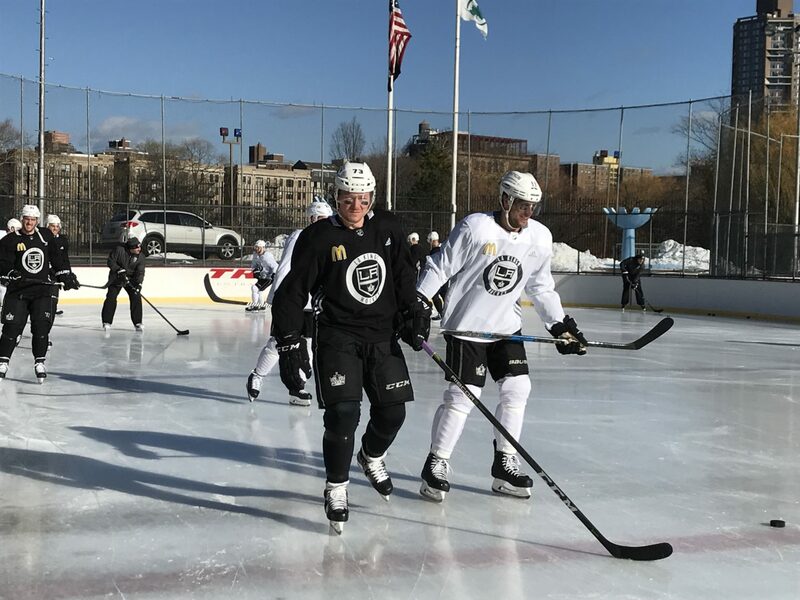 He’s rehabbed from an injury that was going to take some time, and I feel strongly, if you look at players in the league that continue to be really good players at an older age, they’re really dedicated to prepare, and they preally have a deep passion to pay a price to be a good player, and to me, those are the two elements with any player, but certainly with an older player who’s been a really good player in the league, you can’t live on your past laurels. You’ve got to make that deal with yourself and with your team. And he was pretty adamant about his answer. He wanted to do the work, wanted to get back, still felt like he had a lot to offer, and I think he does. [Reporter: For a guy who’s been through as much as he has, for him to get to 1,000 games, I imagine that’s pretty impressive your game.] I think a thousand games for anybody is a big deal. If you talk to anybody, I talk to Foxy and guys that’ve played the game, it’s hard. It’s a hard league, it’s a tough league, the schedule’s demanding. To play 1,000 games is a great accomplishment, and to do it and get 800 points I think is a great accomplishment, and to his credit, he’s a big part of a championship team. I think he was the key guy, like, the star player on his team before. I think there are other players here that maybe are in that light now, but he’s still a really good player. A ton of experience, and he can have that game-breaker ability to score key goals at key times. I mean, it was sunny, but the ice got pretty snowy, too. I mean, it was fine. That ice, it was actually pretty good when we first out there too, because it was so cold. I didn’t really skate too much outdoors when I was growing up. Definitely, it was fun. I think it was good for the guys to just kind of let loose and just enjoy ourselves today. It worked out well. Not too much. 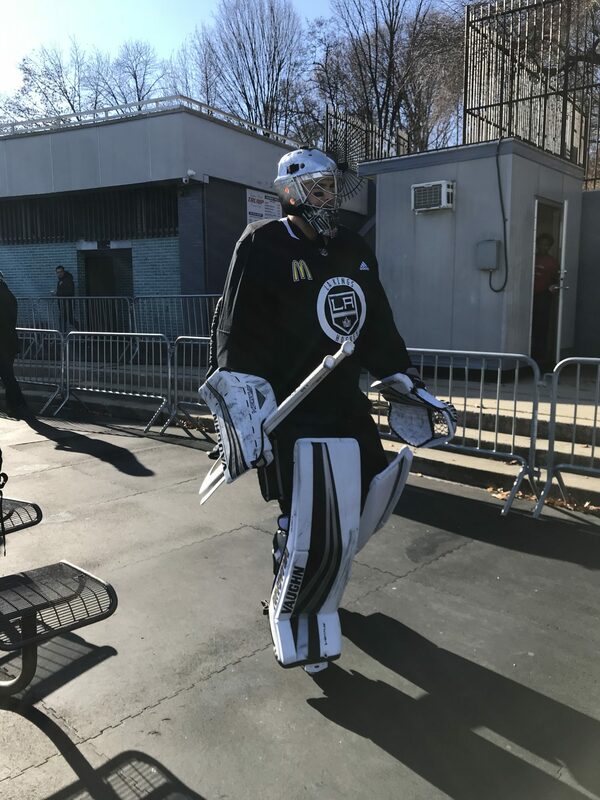 Every once in a while we’d go out there, but there were so many arenas growing up that it wasn’t too hard to find some ice to go to. I think Gabby finished it. I mean, there were some borderline calls there. I’m not naming names, but things could’ve gone our way. Definitely, I think it’s really good. I think so far this year we’ve been a pretty tight group, and it’s fun to do little things like this. I mean, obviously going to China at the start of the year was a big trip, but this is another one of those things where we come together and have fun. Good competition there, and just try and get better. 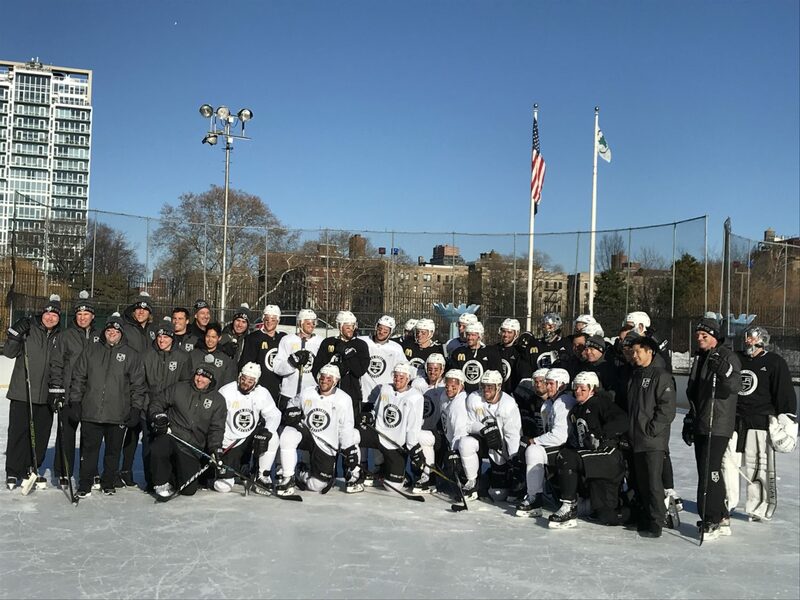 Well, we had an outdoor game against Chicago, but we always did one outdoor practice a year. It wasn’t my first time. 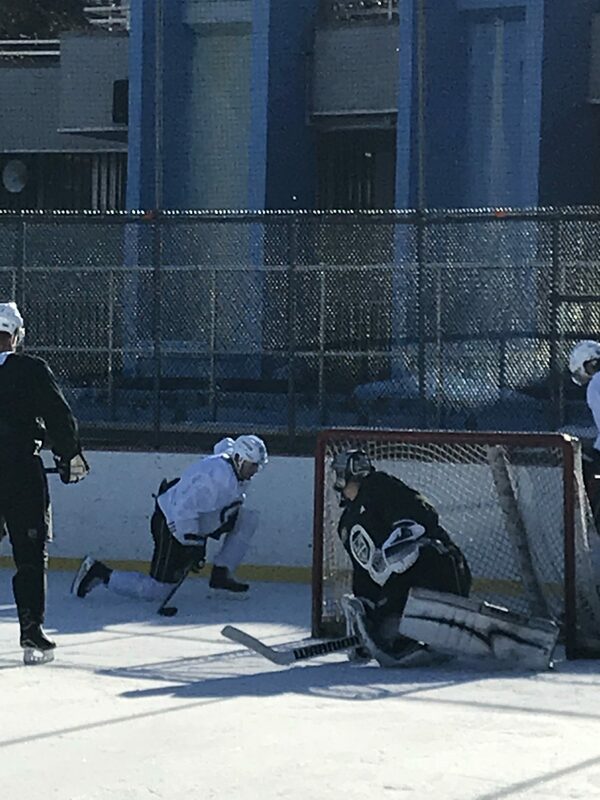 I knew to expect a lot of sun glare, and pretty hard to see the puck. 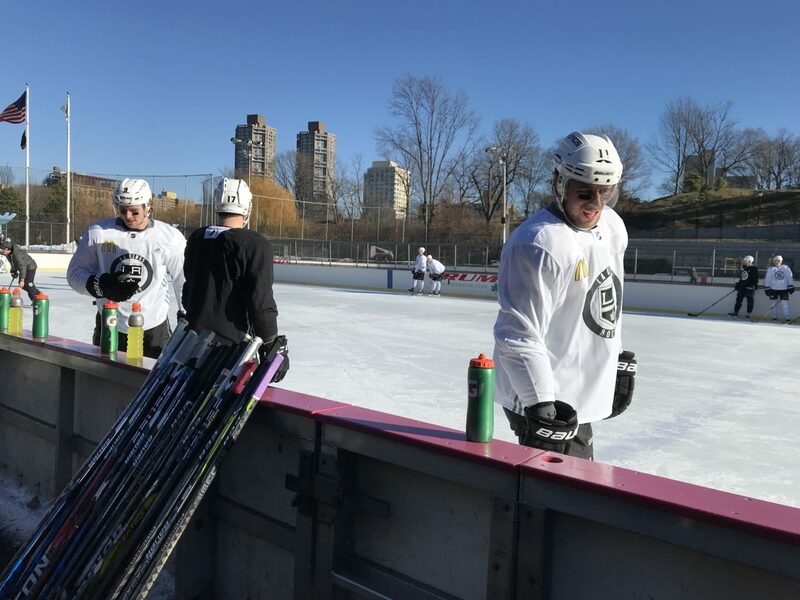 I think we did a good mix of getting some important drills in early just to get something out of it, and then after that, it was good team bonding to have a little competition like that, three-on-three at the end. Oh, yeah. We had one outside our school, and one of my buddies had one in his backyard, so we were out there almost every day. It wasn’t too cold where it was miserable, but it was below freezing, so the ice was half-decent. 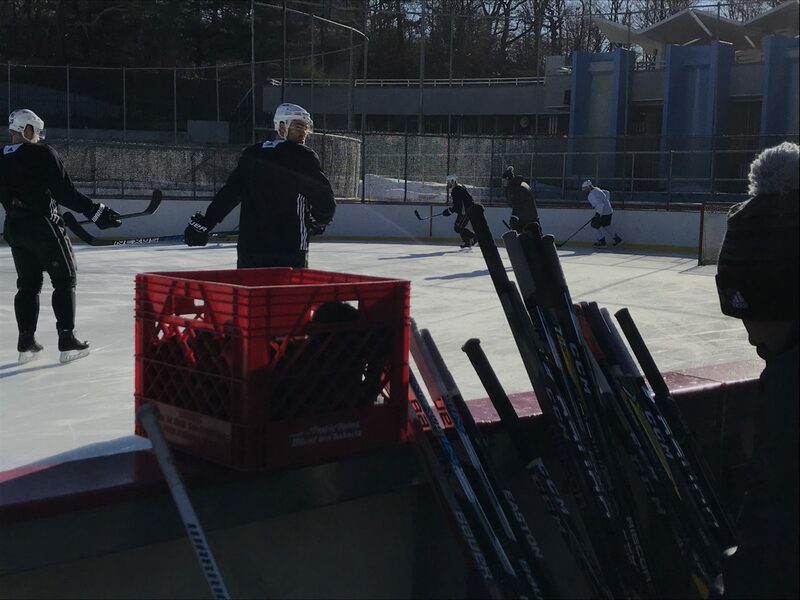 I remember we had [an outdoor practice], and it was above freezing, and the ice was starting to melt and it wasn’t very good. Yeah, I saw a lot of it on the bus trip here. I never actually spent much time in Central Park, so it was pretty cool. 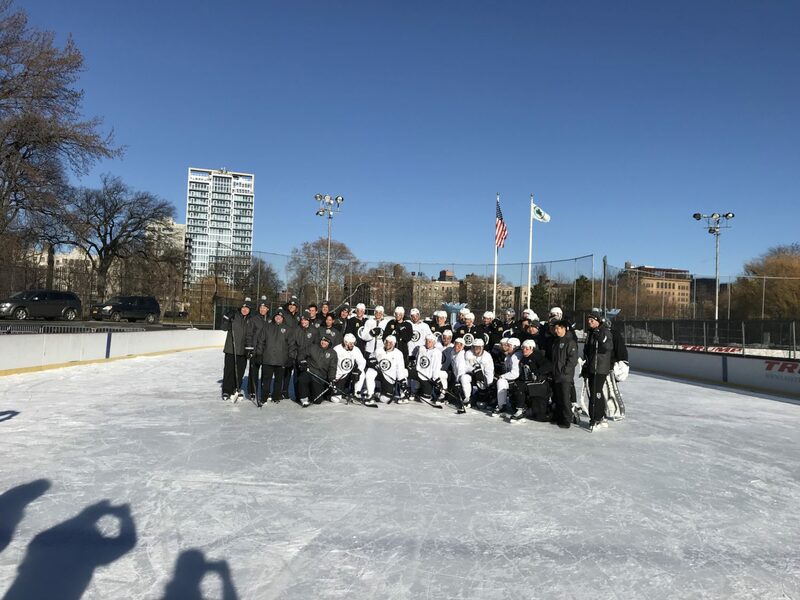 To be able to skate on it, a really good experience for everyone.